When prepared properly, turkey is moist and tender, but when it's reheated, it can sometimes lose its juiciness and texture. After safe storage -- with stuffing removed and the turkey stashed in the refrigerator within two hours of cooking -- leftover turkey can be served cold. But if you’re craving a reprise of your hot turkey meal, the reheated meat doesn’t have to taste like rubbery leftovers. In fact, turkey that’s been warmed appropriately may taste just as yummy and juicy as the freshly-roasted bird straight from the oven. PREHEAT THE OVEN: To prevent bacterial or microorganism growth, preheat the oven to 325 to 450 degrees Fahrenheit. Using a lower temperature will warm up the meat too slowly and may allow bacteria to survive. CARVE THE PIECES: If the turkey was refrigerated whole, slice it into smaller pieces to allow for quick and even reheating. Legs and wings may be left intact, but breast and thigh meat can be carved into slices. PREP THE TURKEY: Place the pieces of turkey in a shallow pan -- a rimmed cake or casserole pan is ideal. If possible, avoid layering meat and try to place pieces so that they don’t overlap. If you’re feeding a larger crowd, it may be necessary to use more than one pan. KEEP IT MOIST: Pour leftover turkey or chicken broth over the meat, creating a 1/2-inch bath of broth in the bottom of the pan. You may substitute store-bought turkey, chicken or vegetable broth or stock. If you don't have any broth, just use fresh drinking water. Cover the pan tightly with foil. COOK THE TURKEY: Reheat the turkey until a meat thermometer inserted into the center of each piece reaches at least 165 degrees Fahrenheit. Avoid touching the bone with the thermometer as it may register higher than the meat’s actual temperature. USE A SHALLOW SKILLET: Place carved turkey pieces in a shallow skillet. If you want to reheat bone-in meat and boneless breast meat, separate the bone-in and boneless pieces into separate skillets. KEEP IT MOIST: Pour broth over the turkey pieces until the turkey is laying in a bath of about a 1/2 inch of liquid. Turn the stove burners to medium to high heat. PREP THE PIECES: Separate bone-in and boneless pieces into separate glass or microwave-safe dishes. KEEP IT MOIST: Pour broth over the turkey pieces until the meat is resting in about a 1/2-inch of liquid. Cover the dish with a microwave-safe lid or plastic wrap, but don't let the plastic wrap touch the meat. Do not cut a slit in the plastic wrap. COOK THE TURKEY: Reheat the turkey, turning the dish every two minutes if the microwave doesn't have a turntable. The turkey is ready to eat when it reaches an internal temperature of 165 degrees Fahrenheit on a meat thermometer. Your microwave manual should provide directions for the appropriate power level for reheating poultry based on the wattage of your microwave. Low-sodium broth or water may be substituted to reduce your salt intake. 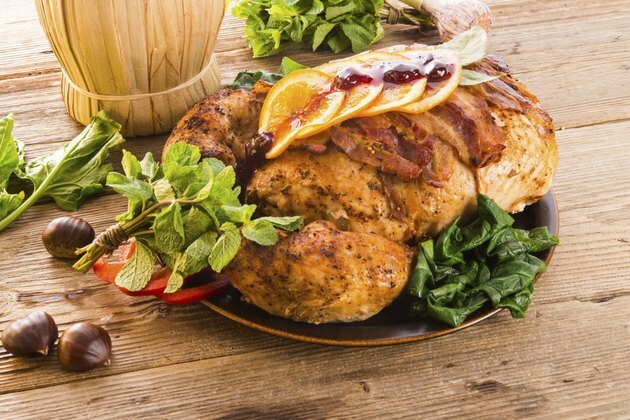 For safe consumption, eat turkey within three to four days of first cooking. You can re-refrigerate reheated turkey, but again, eat it within three to four days of its original cooking date. Cooked turkey may be frozen, and will keep its optimum taste and texture for up to six months. Make sure to thaw the meat thoroughly before reheating to ensure even cooking. Always wash your hands thoroughly in warm, soapy water before and after handling poultry to prevent cross-contamination of meat with other raw or cooked foods. Additionally, make sure you clean all surfaces, utensils and cookware that come into contact with raw turkey. Do not use a slow cooker to reheat turkey as this slow-and-low method of cooking allows harmful microorganisms to grow, and potentially make people sick. Do not attempt to reheat a whole turkey.